Want a calm dog? Just press and play… anywhere! The iCalmDog Standard package includes the portable, blue-tooth enabled player, 4-hours of specially arranged soothing dog music on a Micro SD sound card, a shockproof case and water-resistant case, and other goodies. This fully modified unit – customized for sensitive nervous systems – has no bright flashes or loud prompts. You’ll be very pleased with peaceful, easy functionality and lovely sound quality. Since 2008, thousands of veterinarians and dog trainers worldwide have recommended the slow and simplified classical compositions of Through a Dog’s Ear. This clinically tested canine music is not only for Buster’s discerning ear, but even more importantly, his improved health and calm behavior. The iCalmDog Standard package includes the iCalmDog 4.0 speaker – a compact, easy-to-use speaker, pre-loaded with 4 hours of Through A Dog’s Ear soothing dog music on an easily interchangeable Micro SD sound card. The auto-repeat player function enables uninterrupted listening of this gentle and calming canine music. Featuring fabulous sound quality, the brand new iCalmDog 4.0 can be played 8-10 hours at a time before needing to be charged. All units are shipped in brand new working order, quality-control tested at our Oregon facility. This is a substantial and multi-functional device. The exterior is use-sturdy and fits comfortably in your hand. Click here to view a simple comparison chart of our iCalmDog packages. The included iCalmDog Carry Case will not only keep your Player bright and shiny, but it’s also shockproof and weather resistant. The music can easily be heard even when it’s zipped in the case, meaning it’s great to take on walks! As if that’s not enough, there’s also a little pocket for your adapter and charge cord. Just zip it up and you’re good to go. iCalmDog 4.0 can also be used in Bluetooth mode, making it easy to stream your dog’s or your own music. My boys, retired racing greyhounds Kirk and Elvis, listen to their icalmdog every day ALL day. They love the original music so that’s what we all hear all day and we all love it! They are relaxed, happy and well adjusted and I believe it is because they have listened to icalmdog ever since we adopted them four years ago. My dog Honey started displaying signs of anxiety after the loss of her best friend, my other fur baby Jeze. It was then that I purchased the iCalmDog, she responded to it almost immediately. Later that same year I agreed to foster a new dog, Elsa. Elsa had many problems with anxiety to loud noises, fireworks and storms. She too responded well to the iCalmDog, settling almost immediately when it begins playing. Right now, both dogs are placidly lying on my lap while a storm is raging outside. Elsa is now a permanent member of my fur baby family. I am convinced, after watching Cody, who has had to spend months in his covered ex-pens, between 2 surgeries, that he really is soothed by your music. I witness this, day in and day out, and it brings tears of joy to my eyes that he is so peaceful. Some people would not believe this, but this morning, I hadn’t turned it on, when I switched Cody to the ex-pen in the other room. True story! He sat up and actually stared at the floor where it was and looked up at me, as if to say, “Aren’t you forgetting something?” I turned it on, and he lay down and went to sleep. My 3-year-old little Boston terrier ‘Timothy’ has many “issues”, and has a challenge being calm. I find that since I am usually sitting with him when I play the unit, Dog Mom gets the benefit too; I am so much calmer in the morning, which is not my usual either, “Like Mother Like Dog Son”. We love iCalmDog! There are huge pine trees being cut all day ~ sawing, noisy cracks and banging. I have dogs in the laundry room with iCalmDog playing. Trooper is even yawning between music tracks. I’m amazed how well this works! Muttley is enjoying the newest purchase and addition to Peak Animal Wellness Massage’s toolbox- the iCalmDog! We are excited to start playing this calming music during every massage session. My Lab mix loves the music, and it helps her in the car. She no longer barks the whole time I’m in a store, but now sits quietly and waits for me. It’s wonderful. I have a wonderful rescue Husky – Stella – who was so afraid of everything when I first got her (my very first dog ever). The Behaviorist I was working with recommended that I might also try your music. Through love, training and associating with other Huskies, Stella is now a happy and very well adjusted 3 year old lady. We now work together with BASH (Bay Area Siberian Husky rescue) to foster other Huskies at risk. I use the iCalm from the very first night with a new foster and I am VERY convinced that it has helped each one settle into their crate and rest well at night. I also use CDs in the car on any long trip or when picking up a new foster from a Shelter. These special dogs are often so shell-shocked coming out to that environment and have usually just been neutered or spayed…so not feeling tip top. This helps them relax and get needed rest. Can’t say enough good things about the iCalmDog! You can take it anywhere with you! In the car, outside, any room in the house, etc. Plus it helps me too. I can get stressed when my dogs are and the iCalmdog keeps me peaceful too so that I don’t transfer my state to my dogs making matters worse. I just got your iCalm Dog set and used it during my first housecall massage session for a very active Vizsla. He is owned by a tech at our practice, so I knew all about his personality. Anyway, he got up a few times as he is a restless dog, but overall the music kept me and the owner more calm and I think contributed to at least part of his relaxation. I recently attended Dr. Narda Robinson’s class on Medical Massage for Animals in Colorado, and the massage therapist instructor who does a lot of animal massage swears by your product. I’m hoping to try the iCalm Cat out on my neighbor’s busy felines as I teach her a few massage strokes for her cats. Thanks for the wonderful products. 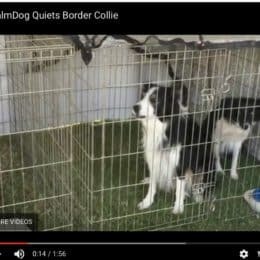 I first learned of this calming music for dogs several years ago. I recommended it for a client with an anxious dog, and it worked so well, that I bought some of the music for my dogs and myself. I have since tried other dog calming music, but this music from iCalmDog is, by far, the most effective that I have found. It really delivers as promised. 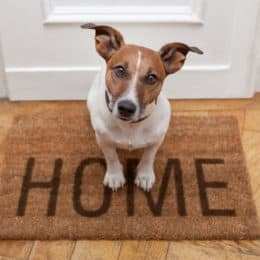 In addition to recommending it to my clients with nervous or anxious dogs, I use it in my dog training classes to calm the “first week jitters”, and in my own home to calm my dogs whenever things get stressful, such as during thunderstorms. I have even used it with great success to calm my daughter when she was colicky as an infant. I very highly recommend this music to anyone with dogs (or cats!) It is nothing short of amazing. I am a certified Canine Massage Practitioner and have been volunteering at a local animal shelter massaging the rescue dogs . Not surprisingly, when I arrive, all the dogs are barking in their pods. But after only a few minutes from turning on my iCalm Dog, the dog that I am working on starts to relax and all the other dogs stop barking and settle down. One day a visitor was looking at all the rescues and stopped to ask me a question. I turned off my iCalm Dog so that we could talk and all the dogs started barking again. I turned it back on and they stopped. She told me that if she hadn’t have seen that for herself, she never would have believed it. 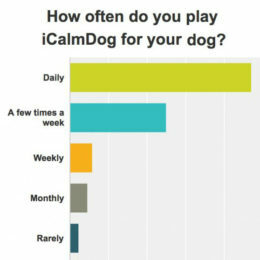 I use the iCalm Dog for all my at-home sessions with the same type of positive results. The iCalmDog has been a huge help in getting my sweet Tippy girl used to her crate at home and distracted through my towns firework display over the weekend. I turn on her music before I crate her when I leave for work and sometimes she’s still sleeping when I get home. 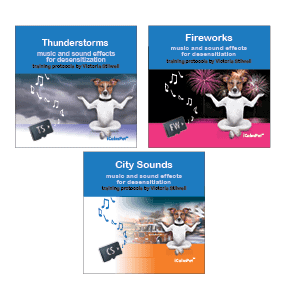 iCalmDog is awesome for our dog, Nicky, who suffers from anxiety from fireworks or similar loud noises. During the introduction period we put his music on the porch while he sat in the grass relaxed and happy. Two nights ago he was upset by some sound in the night and displayed his anxiety by shaking, panting and refusing to sit or lie down. I turned on his music, he laid down right by the iCalmDog and promptly fell asleep. It was nothing short of a miracle. 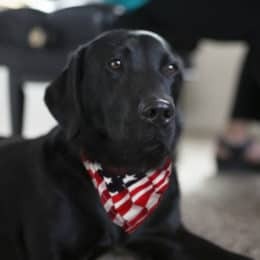 We are confident that he will get through this year’s fireworks season as a calm and happy dog. The customer service at this company is just as awesome as the product. Exception product and exception company! For two puppies that are far too sensitive for this world and one senior, this gorgeous little music box delivers CALM faster than any calming remedy…We listen day and night, inside and outside, in the car, on walks, at the vet, during acupuncture, playing music all the way there and back and inside at UC Davis today! … Hubby says it calms him too while sleeping! Mostly love it when we have to leave them in the car, the music continues while we are gone. Just wanted to let you know how much I love the iCalmDog!! I have had the CDs for years, but the sheer convenience and portability of this nifty little device can’t be beat!! I use my iCalmDog during canine massage sessions and all the furry clients LOVE it! I love iCalmDog and iCalmCat for my patients at the vet clinic, for my training consultations, and my own dogs. It’s wonderful for my thunderstorm and noise phobia cat, and my anxious dog! No more hiding under the bed! To others who are skeptical: although my dog wasn’t destructive, he became terrified as soon as rain would start…not even the thunder…the rain! Using the iCalmDog stopped the constant pacing, panting, and trembling. Even though he has not yet gotten to the point where he can sleep through the storms, this product has made SUCH a difference to how he handles them. I’m very thankful that my research led me to Lisa’s beautiful music. Your music has helped my dogs with car rides and storms. I do so appreciate your wonderful music! We will forever be in your debt. The music has really helped her through the thunderstorms this week. I play the iCalmDog at least 4 days a week with my own dogs and have incorporated it into my canine massage business as well. I have had many clients ask me where to get one for their home. We purchased the iCalmDog at the recommendation of the behaviorist we are working with and have seen great results! Our pup, Maggie, is on prescribed medication to help her cope with her anxiety issues and extreme noise sensitivity. We have been able to use less medication since we started using the iCalm Dog and expect we will be able to stop medication altogether at some point. It is wonderful to take to vet appointments and just to have in the car to block out the traffic noises. 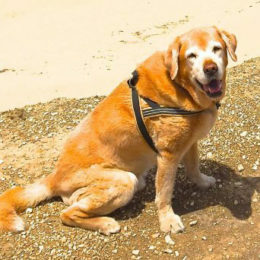 Our iCalmDog was invaluable when we moved with the dogs from a quiet house in the countryside to a village by the sea. 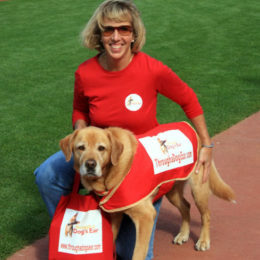 I also use it at my dog training classes to help the dogs (and owners) settle and relax. Whenever we do a shopping trip & have to leave the girls at home the iCalm music gets turned on & the results help Abby & Annie to relax during the times we are gone. It’s a blessing for both of them & us to. I not only play the music for my dogs, I started playing it for my horses! My 4 horses had to be sedated this past week for dental work. I decided to play the I-calm music after the procedures to keep them calm. They all snoozed quietly for an hour afterwards. I first experienced the music from ICALMDOG when my italian greyhound (IG)was due for his annual physical. He is a rescue & is always a little nervous/anxious. We were in the exam room waiting & listening to the music. Immediately upon hearing the music, my IG became more at ease & relaxed. I could see him listening to the music. I immediately came home & ordered one. I play it for him every day & feel that it has really helped him. ICALMDOG has even helped him at home when we have people over as he will come out into the room more & go up to people more now. I mentioned it to our IG rescue group director & now are awaiting our shipment. Thanks so much for coming up with the ICALMDOG & music. It’s helping so many precious furry family members worldwide!!!! I have use the iCalm in my car to help relax my two pups that are not big traveling fans. I use it in my house to help soothe both my pooches and myself. I use it at clinics while my dog rests in her crate. I used it to soothe momma dog and CC puppies so that it could be used by their new owners to take them home and to help them adjust to their new home. I got an iCalmDog intially for my adolescent (female), but my older males (3 and 12yr olds) are the ones I was surprised really soothingly settled right down with it. (i.e. treats, clicker, iCalmdog)! My Dogue de Bordeaux suffers separation anxiety. He broke the door off his steel crate (hurt himself in the process). Then he would do battle at the door to go with me. I was at my wits end when a vet told me about Through a Dog’s Ear. I trained him by creating a calm routine associated with my leaving. I put on the music at first, letting it lull him. Then I would put on the music, pick up my keys/purse and stand by the door (no eye contact, no speaking) until he was calm. Then not leave. The final stage was to put on the music, pick up my things, stand by the door and leave when he was calm (sometimes up to 10 minutes). This took about a month of progressive training. Now I put on the music, he goes to his bed, and doesn’t even look up as I leave. The bed was his idea, not mine. It has been 5 years of peace since I first found your products. I’m SO grateful. I love that you have different music for different anxieties. The portable aspect of the iCalmDog is wonderful for all kinds of events. I recommend you to all my friends & clients. Love, love, love your music and the icalm dog (we purchased one of your original units) It’s a permanent fixture in our puppy nursery. We play the cd’s in the kennel and in our grooming area. Love your products. Keep up the good work. We love our iCalm Dog and it really helps during thunder storms and when there are other noises. We have recommended your music to many of our friends. I love the new 3.0. Dina fell asleep in acupuncture, and had hers with her when she had lump surgery. The vets and techs loved it too. Your little “music box” has been a God send. Our British Spaniel, Schnitzel, has shown signs of Canine Cognitive Dementia (CCD). He is 15 and we think he was well into this disease when we found him. With treatment he has stabilized for a while but he walks constantly during the day and will not calm to sleep at night. I must stay on his bed with him until he drops off to sleep; sometimes 4 times a night. Up until now, we had not found help for this. I thought the iCalmDog might help and it certainly did!! He settles much faster and drops off to sleep and I am far more relaxed too. I put it right by his ear because he is really hard of hearing. I’ve had it a week now and he just settles in when I turn it on and hold him. It has truly saved my sanity! So thank you so much for this help when we really needed it. Hi, Lisa! I just wanted to tell you how THRILLED about the device I got from iCalmPet! The foster dogs I have are all entranced by the music and are so relaxed or fall asleep! I’ve never had total quiet in the house before with 7 bassets! I’m spreading the word! I have really great news! I bought the icalmpet tool to give as a gift to my neighbors because their dog barks all the time, routinely disturbing the peace of us and other neighbors. Unfortunately, my neighbor wasn’t interested in giving it a try. However, I decided to just play the icalmpet music from my house, pointing the speaker in the direction of my neighbor’s house. And guess what? It worked!!! Their dog immediately stopped barking! We’ve been doing this every day for about a week now. When their dog starts barking in the morning, we just turn on the music. And he stops barking! To that end, we will definitely NOT be returning our purchase for a refund. We will be keeping it! My 10-year-old dog and his 69 year old owner just moved to a new state in a house with 15 stairs. Every time I had to leave him in our room he would bark for as long as I was gone. People I moved in with were insisting I get rid of him but I did not want to loose him or use a shock collar. The people I live with even suggested getting his vocal chords cut. I am grateful to the recommendation in the AARP magazine which led me to you. The very first time I used the music he settle down and did not bark the whole night. This is literally the salvation for our living together.